This exercise is intended to increase the mobility and flexibility of the thoracic spine and ribcage for increased lung capacity and improved posture. To do this exercise you will need a mat and a soft ball. Start by lying on your back with your knees bent and your feet planted into the ground. The soft ball should be under your ribcage right between your shoulder blades and your hands should be clasped behind your head for support. Inhale as you extend your spine over the ball allowing your head neck and shoulders to open towards the floor. Then exhale as you narrow the ribcage and begin to use the upper abs to bring the thoracic spine into flexion. Repeat 8-10 times. If you have a diagnosis of Osteoporosis you want to be sure to move between spine extension and neutral in this exercise. This means that your head will never come higher than your neck and shoulders. Extension done safely is excellent for osteoporosis, but flexion increases the incidence of possible fractures. This is also not an exercise for the low back, so be sure that the low back is relatively still as the thoracic spine continues to move. This will help distribute movement across the whole spine so that the low spine is not overworking. This exercise is more about the breath than the abdominals (Are you sick of hearing this yet). 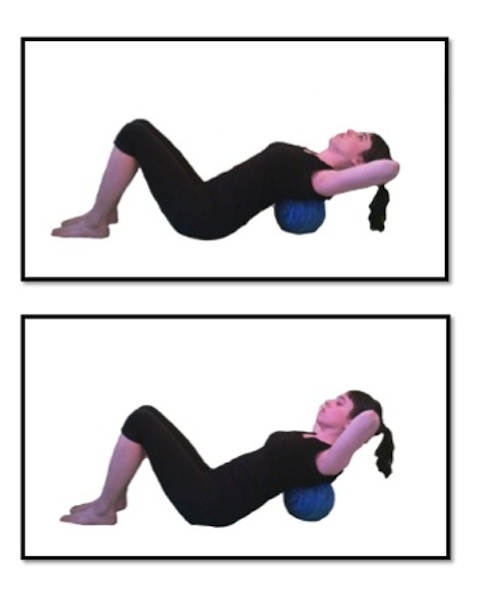 The abdominals play a role, but abdominal work without breath can lead to a compressed dysfunctional lumbar spine.